The latest version of CGTech’s CNC machine-simulation software, Vericut V8.1, features additive-manufacturing (AM) simulation capability. With more manufacturers adopting AM into their daily operations, say company officials, the timeliness of adding this new capability is critical. 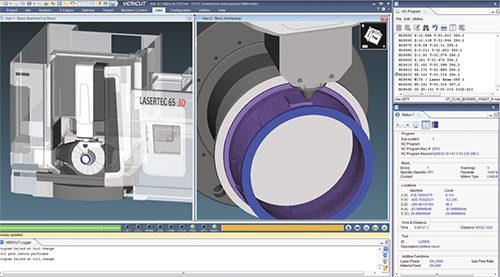 Vericut V8.1 simulates the same NC code for AM that will drive the CNC machine, enabling companies to virtually experiment with combining additive and traditional subtractive metal-removal processes, to determine optimal, safe hybrid production methods. Other new software enhancements promise to increase the ability of manufacturing engineers to analyze, optimize and document the CNC programming and machining process. Intelligence gathered from the cut part and the machining process will help shops achieve a higher level of accuracy and efficiency.